Looking for a way to blow off some steam before the big Thanksgiving family gathering? Try the Pie Race! Thanksgiving is that one day a year when we really really indulge (well, most of us anyway). Do you ever feel guilty afterwards? Are your family gatherings big and loud and delightfully overwhelming? Taking a little time-out before the feast can help you feel better about all that food you are about to eat and it's a really nice way to have some time to yourself (albeit surrounded by a bunch of runners) letting loose. The Rotary Run 3.14 Pie Race benefits the Rotary Club of LaGrange and is a beautiful run through fallen leaves in the town. 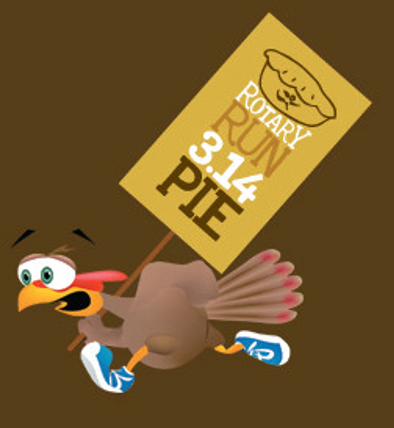 It's 3.14 miles and if you are one of the first 200 to register you get a free Sara Lee pie at the end of it all! (Or if it's cold like last year and you are one of the brave souls who comes to run anyway, you might just get one that way! Click here to register for this fun run and if you plan to play a little touch football after turkey time, read here for tips on preventing a common injury sustained over Thanksgiving weekend!